One of the most common causes for frustration when using a web browser is accidentally losing data you have typed into the page. Whether this is typing into an online form, commenting on a blog/forum or writing an online document, it’s not fun when everything is wiped away. This can simply happen if you close the browser by accident by pressing X to close the window or the Alt+F4 shortcut. While it’s possible to reopen the web pages that were previously open before the browser was closed, any data that had been typed in will be lost and you’ll have to start over. To help prevent this kind of accident several web browsers include an option that warns you if you try to close the browser when multiple browser tabs are still open. Not all browsers have this warning though, so if it’s an important function for you, you will either need to find a workaround or use another browser that does have it. In most supported browsers it’s also easy for anybody to disable the warning prompt, so you’ll need to know how to re-enable it again. Here we show you how to get a warning popup if your browser does not have one built in or re-enable the option if it’s been disabled. It’s quite amazing to think the world’s most used browser does not have what is such a simple but yet potentially important function. Despite repeated requests Google simply refuses to implement a confirm on exit popup if multiple tabs are open. Even extensions can’t provide something that works like most other browsers. Solutions have been released over the years, like Chrome Toolbox, but most have been discontinued or don’t work anymore. There’s still a couple extensions that may be enough for your needs although they are not a true alternative to what other browsers offer. This is a very simple extension with no options. 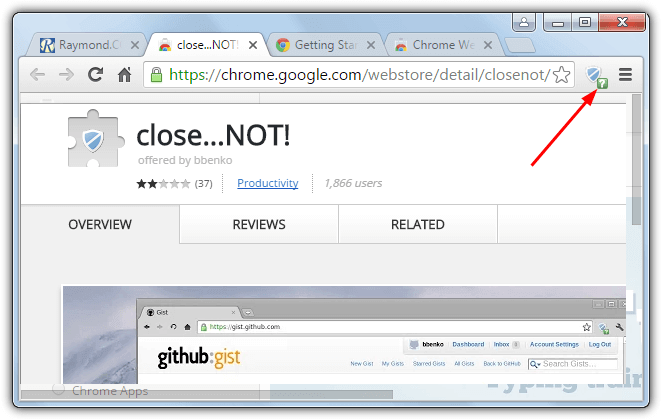 It works by locking the current browser tab when you click the Close…NOT! icon, at which point a green question mark will appear on the icon. Trying to exit Chrome while at least one of the tabs has the question mark will prevent the browser being closed. 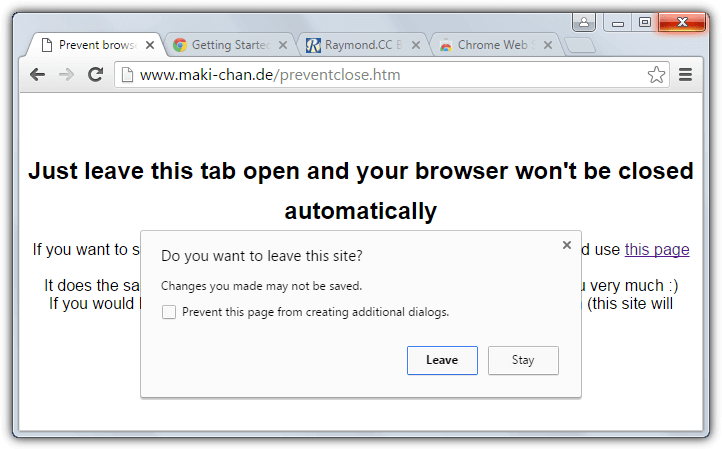 A popup will appear asking you if you want to Leave or Stay, leave will obviously exit Chrome and you’ll lose all open tabs and filled in forms etc. Lock it is a similar tool in the way it works to Close…NOT!, install the extension and click the lock icon while in a tab to lock it. The same popup will show if you try to close the locked tab or the browser. Lock it does have one option, which is to reopen closed tabs after they have been locked. Note that once enabled for the first time, both these extensions require currently open pages to be refreshed or reopened. While the above extensions are not true multiple tab warning popups, they do offer an added bonus. That is you can stop the browser closing even if only a single tab is open, other methods only work with more than 1 open tab. There is another similar way to make this type of popup appear simply by opening a webpage, see the bottom of the article for instructions. 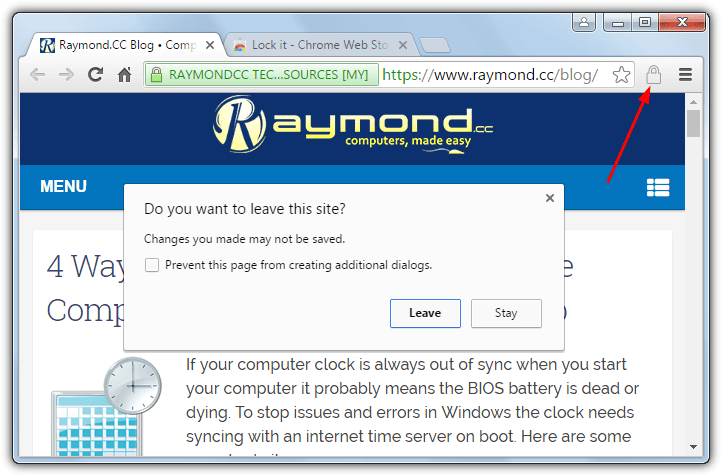 Most of the third party browsers based on Chromium also do not include a close confirm option. That includes the likes of Opera and even Vivaldi. Of the dozen or so browsers we tested, we did find a couple that warn you when trying to close multiple tabs at once. If this is an important function and you want a Chromium based browser, they are worth considering. Flashpeak’s Slimjet browser has a number of features over the basic Chromium. These include built in ad blocker, integrated file downloader, photo enhancer and uploader, video downloader and social media integration. The option is off by default. 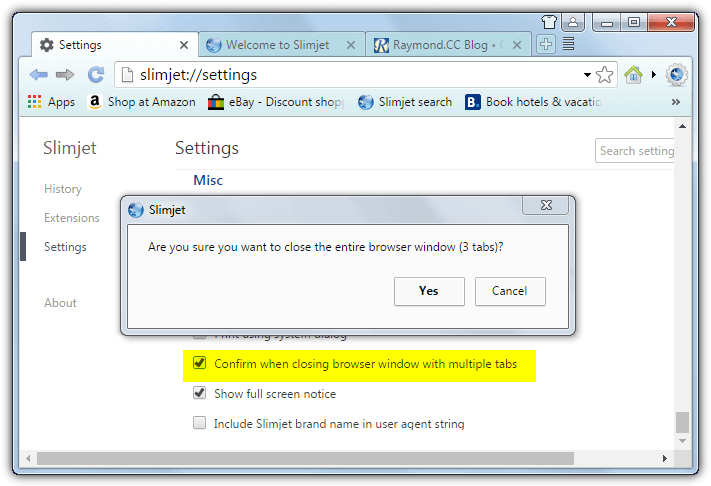 To turn it on go to Settings and at the bottom in the Misc section check the box for “Confirm when closing browser with multiple tabs”. Now a popup will ask if you want to quit and tell you how many tabs will be closed. Many people will know of the smartphone version of UC Browser but maybe don’t know there is a Windows version based on Chromium as well. It too has some interesting features like data saving technology, video downloader, ad blocker and mouse gestures. By default the confirm close if you have more than one tab open is active so you don’t need to do anything. If you check the box to not show the popup again, it can be reactivated by going to Settings > Tabs and checking “Warn if there are more than 1 tab to be closed when exiting”. 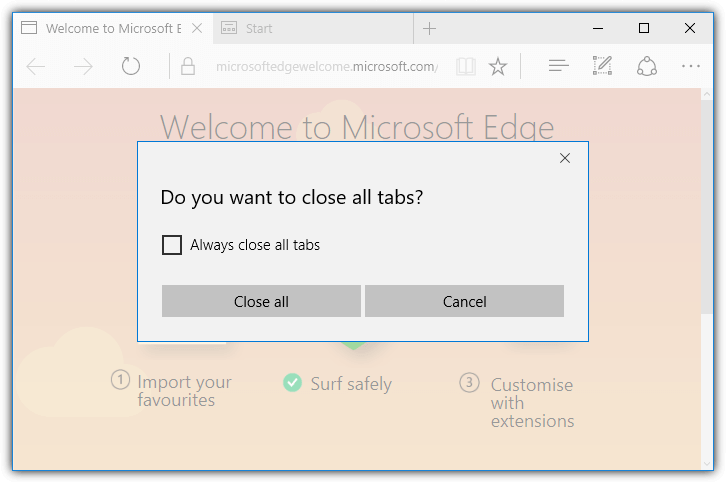 Edge is a bit of a love it or hate it browser but it does have a warning when closing the browser with multiple tabs open. 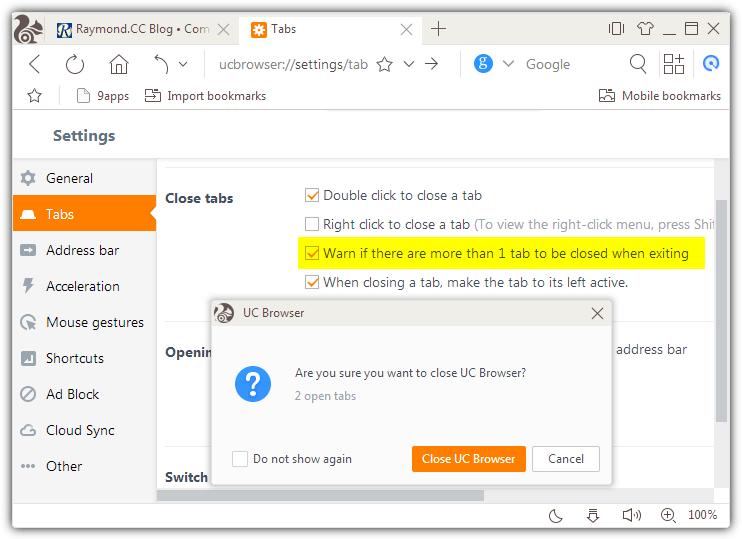 It’s a half hearted attempt though because if the option to always close all tabs has previously been checked, you can’t disable that setting again from within the browser. 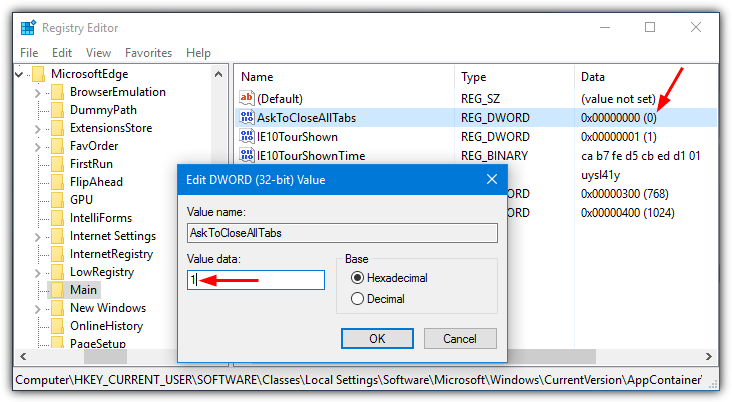 In the right pane find the value name AskToCloseAllTabs, if the option is disabled the value will be 0. To turn in back on again, double click in AskToCloseAllTabs and change the value to 1. Click OK, exit Regedit and the option will be back the next time you close Edge. For convenience you can download an enable AskToCloseAllTabs registry file that we created earlier. Simply download it and double click to import the data into your registry to re-enable the warning. Internet Explorer has been replaced by Edge in Windows 10 as the default browser. But it still has a few things other more up to date browsers don’t, one of which is a simple warning when closing the browser with multiple tabs open. Where Edge makes it unnecessarily complicated to turn the warning popup back on if it’s been disabled, with Internet Explorer it actually pretty simple. 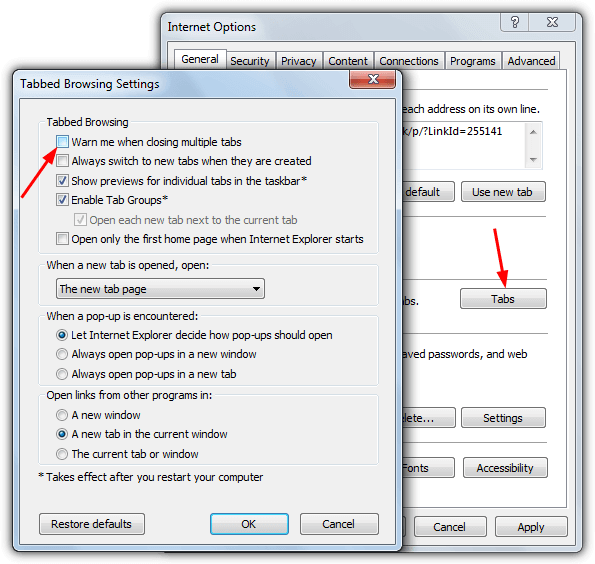 Click on the Settings icon (Alt+X) > Internet Options and press the Tabs button. The setting to enable the warning popup is right at the top. Simply check the “Warn me when closing multiple tabs” box and press OK. 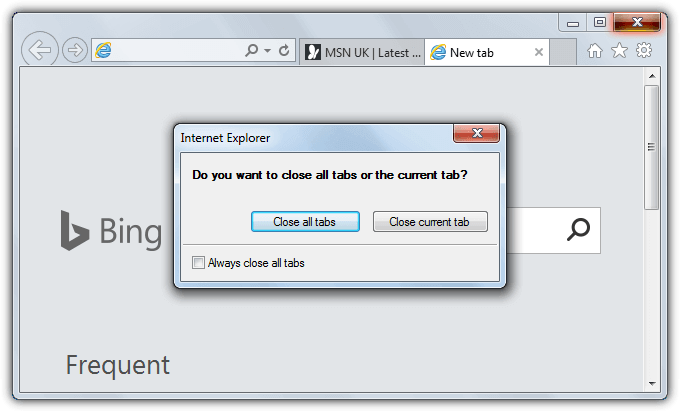 This will make the popup return when closing IE. 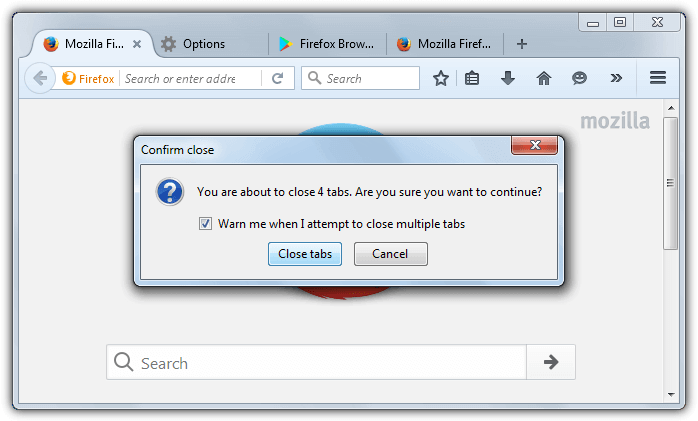 Firefox has the simple ability to warn you about closing multiple tabs, and has had it for a long time. As it’s is built into Firefox, that also means most third party browsers based on Firefox also have the option as well. These include Pale Moon, Waterfox and Cyberfox. The popup window also tells you how many tabs are currently open if you didn’t realize there were so many. 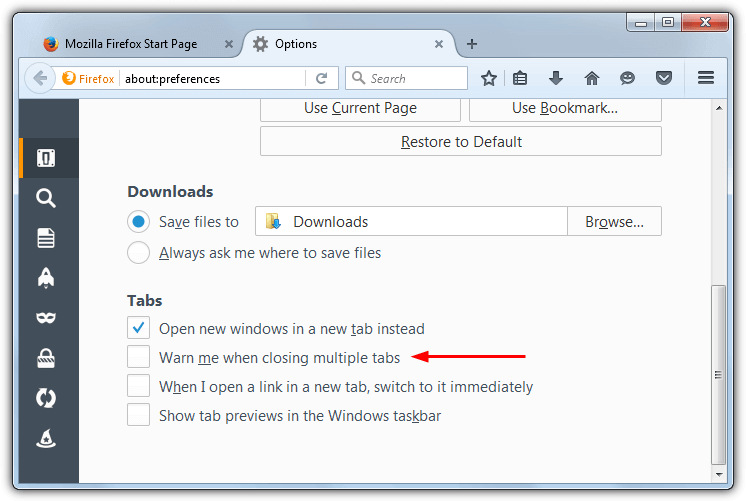 To get the popup back if it has been disabled, go to Options on the menu and the check box “Warn me when closing multiple tabs” will be available under Tabs on the General page. Note the option to re-enable the warning only becomes visible after you have unchecked the box on the close confirmation popup in the first place. If your web browser doesn’t have the option to warn you when closing multiple browser tabs at once, or for some reason the popup isn’t appearing when it should, here’s something else to try. Simply load this webpage into a tab and leave it open. Then drop the HTML file onto your browser or set it up to load the local page on start. That way you will always be asked for confirmation when closing the browser window. While this is by no means a perfect solution it does offer a way to try and stop you accidentally closing several tabs at once in most browsers. Oh cripes has that happened to me to many times to count :) Thanks for this. This is what I’ve been searching for! Thanks Ray! btw did you now double click on most upper left make chrome exit too? it happened to me because my mouse do the double click when i click just once. I happened with me once but I opened my tabs through history option, but this one is better!!!! !